Yesterday was my kid brother’s birthday. He turned 24 years old, so when I say “kid brother”, I basically mean we are essentially the same age since I am 26 in August. Growing up less than two years apart meant that we grew up together THE WHOLE TIME. We are in it, this rough ol’ place, together. Luckily, Zach and I have pretty much the same sense of humor and/or interests in everything, entertainment-wise Our favorite movies were all shared growing up, until that iceberg tore us apart and I spent some time with a man named DiCaprio. One summer, we watched Grease every night. We are so cute I could just tell you about it all day, but I’ll get to the point here. I asked Zach what movie I should write about to honor him, and though I was leaning Ferngully (because today is Earth Day! And the main dude’s name is Zack! 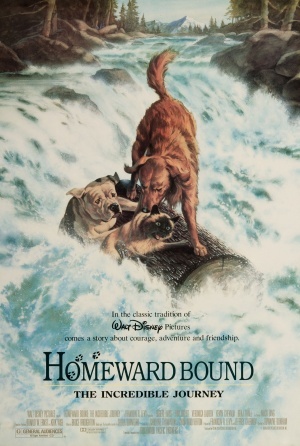 ), he chose Homeward Bound, and for my brother, anything. 1. Your mouth doesn’t have to move in sync with your words. One of the best parts of this movie is the way they make the animals “talk.” To this day, I’m still not sure if we are supposed to think they are speaking to each other, or if we are supposed to think they are reading each other’s minds and/or communicating nonverbally, like animals do in real life. And you know what? I don’t even care what we are supposed to think because this movie is perfect. The Adventures of Milo and Otis have the same thing. It is SO much better than the talking animal movies that try to make the animal’s mouth move–like that cat in Sabrina the Teenage Witch. What is that thing’s name? Sabrina? Oh my god obviously not Sabrina, that’s the girl’s name. Oh, Chance–always getting into trouble. Don’t eat grandma’s cake and then throw it up all over the grass. 3. Porcupines are the worst. I’m not one for little vermin type creatures in the first place, but when my poor Chance gets pine-needled in the face, it only solidifies my distaste for the little jerks. Sure, Chance is high energy and doesn’t know when to back off (he’s probably a Leo) but he doesn’t deserve that kind of pain! And then he has to go to the vet! Vets are the worst! They must be the pet equivalent of going to the dentist. …or the DOCTOR, which makes more sense. Chance: Okay, okay, I’ll talk! I left a gift on the carpet. I let Sassy take the rap for when I unrolled the toilet paper all over the house. I stole underwear on three occasions. 4. Cats and dogs really CAN get along. Shadow and Sassy = adoring best friends. Sassy and Chance = best friends who talk a lot of smack to each other. Both kinds of best friends are the good kind. 5. Cats rule and dogs drool. Now I love me some Sally Field, especially her soothing momma voice, but this lesson is actually totally untrue. Though I appreciate Sassy’s, well, sassiness: “Cats are smarter than dogs, and more attractive, and we don’t drink from the toilet!“–dogs will always be better than cats. And I’m pretty sure on the whole, dogs are smarter and more attractive. Though I’ll give her the toilet thing. 5b. I’D LIKE TO POINT OUT, WE ARE DEALING WITH A STEPDAD IN THIS MOVIE, LIKE IN ALL 90S MOVIES EVER. It’d be pretty rad if you could sleep for a month and wake up beautiful. I’m IN. I don’t have a month to spare sleeping, and actually think I’m quite beautiful as is so NM. 7. Michael J. Fox has the best voice in the world. It’s funny when I hear Fox speak now, I see Chance, even though I associate Fox with like a million other things, as well. 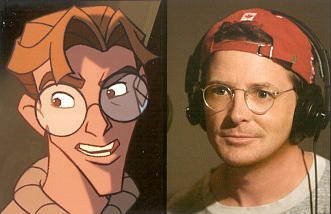 He just has the PERFECT voice for a character. Stuart Little, anyone? 8. Old man dogs and young pups have the greatest relationship known to the universe. We have had a few pets growing up. Like a million cats, a couple of dogs, even a bird and a bunny and a guinea pig named Scooter, but the two that were truly like family to me were a dog named August Sunshine, and a dog named Spook. August came first. We adopted him when I was twelve (a birthday present for me!) and Spook followed shortly after. August was older, a gorgeous white German Shepherd with a puppy’s soul only when playing hide and seek or after breaking into the cookie jar. (He was awfully misbehaved, like his mother.) Spook was young and vibrant and shook when anyone raised their voice or it was too cold or basically anytime, hence his name. We moved homes my freshman year in high school, and Spook, though sweet and fun to play with, had a reckless nature and less brain capacity than his buddy August. He ran away and was killed by a car on a busy street very shortly after we moved in. August lovehated Spook. He literally grumbled when Spook would try to get his attention. I am pretty sure I saw him roll his eyes once or twice, but when Spook went missing–there was a solid day in between his departure and the unbearable reality of his death–August did not leave the couch, chin propped up on the top edge, eyes gazing sadly out the window. I knew Spook was dead, because I knew August knew it. He didn’t budge though, and he was never really the same again. They were SO very much Shadow and Chance, and I know August was greeted by Spook with warmth (and Spook with an eye roll) when August joined him in doggie heaven years and years later. Shadow: I shouldn’t have made her come. Chance: It’s not your fault, she wanted to come. Shadow: But it’s my responsibility. I had a responsibility to Sassy – to love her and protect her – the same as I have to you, and to Peter. And the same as you have to Jamie. Chance: But we didn’t ask for this job. Shadow: We didn’t have to. It’s built in. Has been ever since the dawn of time… when a few wild dogs took it upon themselves to watch over man, to bark when he’s in danger, to run and play with him when he’s happy, to nuzzle him when he’s lonely. That’s why they call us man’s best friend. Chance: Looking at him that night, he seemed so wise, and ancient–like the first dog who ever walked the earth. I just hope that one day, I can be like him. 9. STAY AWAY FROM TRAIN TRACKS. UM AS IF EVERY MOVIE FROM MY CHILDHOOD DIDN’T TEACH ME THIS ALREADY, HOMEWARD BOUND OWNS THE LESSON. 10. Never give up hope. Oh, you guys know the part. You know the part where everyone comes running home and the last we have seen of Shadow was when he was muddy and old and stuck in a fallen pit of sadness, and and and then Peter is just standing there looking off in the distance wearing a strangly age inappropriate Cosby v-neck sweater and a button up shirt to prove that he is mature for his age, and then he gives up and walks away and SHADOW COMES LIMPING UP THE HILL LIKE A P-I-M-P and oh my god if you aren’t crying right now, I don’t think your tear ducts work. Never, ever, ever, ever, ever give up hope. Ever. Especially when it comes to your dog. He loves you. Featured image via movieposterdb, MJF/Milo image via laughingplace, gif from tumblr.